The State of the Netbook. 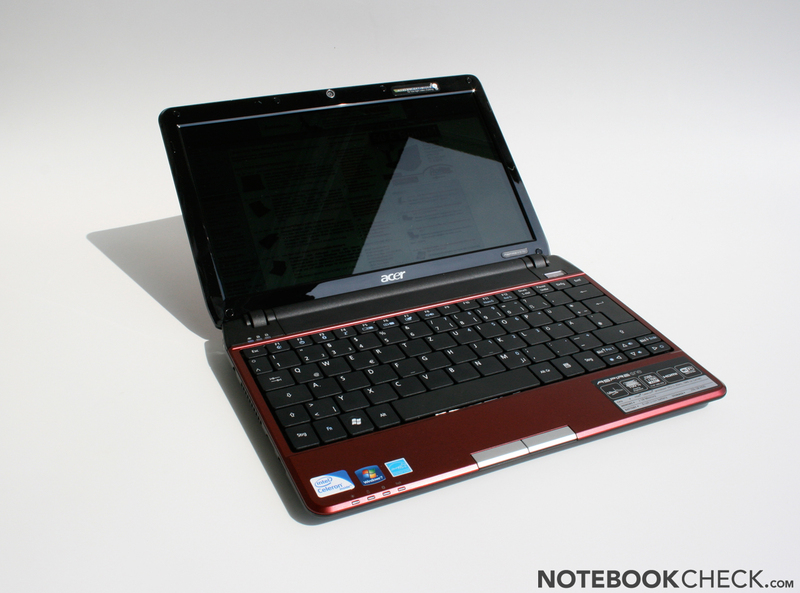 The favorite Acer Aspire One brand launches yet another netbook: the Aspire One 752. This one is equipped with an Intel Celeron M processor under the hood and is expected to deliver more performance than the weaker Atom-based devices. To find out whether this Acer netbook delivers on all its promises, and to see if netbooks are indeed necessary after the launch of a device like the Apple iPad, read the following in-depth review. 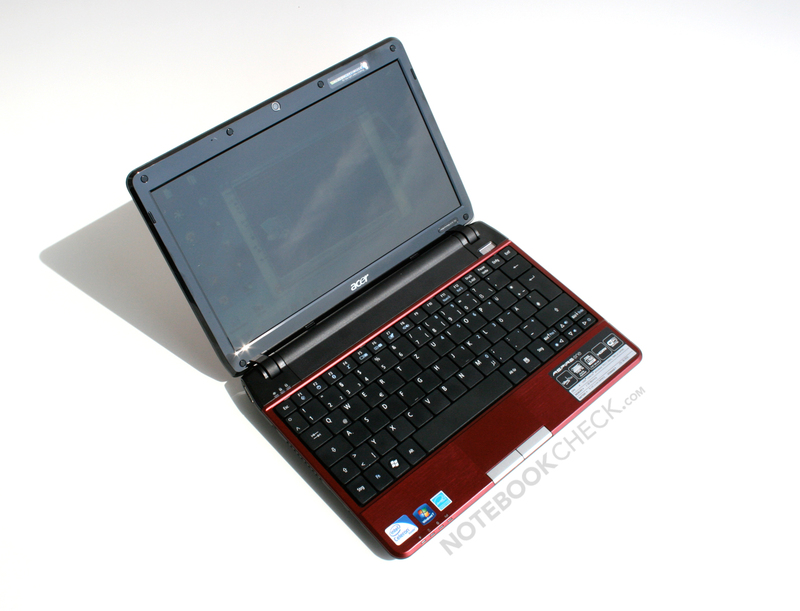 Netbooks have been a topic of constant debate in recent times. We have written on and on about these small machines with compact cases, respectively small displays, long battery life, and low prices. Such tiny PCs are considered mobile demi-gods which allow users easy internet access on the go and use of office programs for affordable prices. However, there are enough reasons against the purchase of such netbooks: sellers are just out for profit, the customers are dissatisfied with the performance of the devices, and for the same price the buyer can buy a bigger device with a higher performance. As the iPad has been recently released (at least in the USA), we have to take another look at these so-called netbooks and find out if they are really necessary. I wrote my last article for Notebookcheck a while ago and it was about Macbooks, equipped with Core 2 Duos and SSDs which helps increase the performance of the programs. In contrast to that article, this time I am writing about "basic computing" instead of the high-end performance delivered by a Macbook. Basically: Netbook. 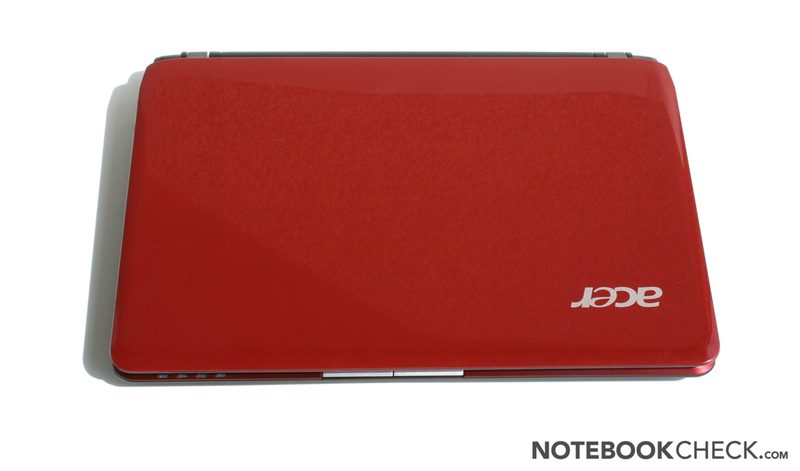 The Acer Aspire One 752 uses a case with aluminium covering. 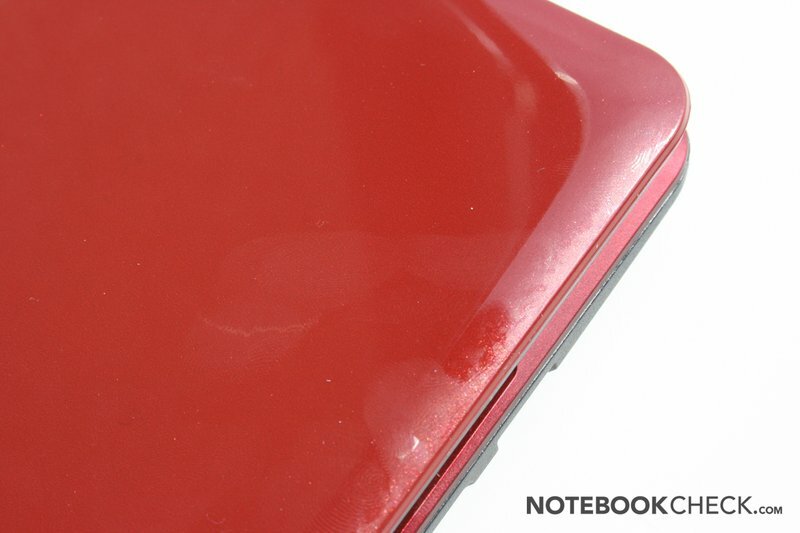 Unfortunately, the laptop cover has a red, glossy lacquer, which is in accordance to the current trend, but is a big problem for those users who do not like to see smudges and fingerprints all over their netbooks. Thankfully, Acer chose a plastic surface with aluminium bordering for the rest of the case. The customer can choose from black, white or (as in the case of our test model) red for the colour of the netbook. The feel and the workmanship of the test model is definitely all right for a product of this category. The hinges are sturdy yet give way slightly on bumpy rides (train travels). The dipslay can not be completely closed due to the lack of a locking mechanism, and is thus fallible to opening up during commute. The maximum angle the display can be opened to is 135 degrees. 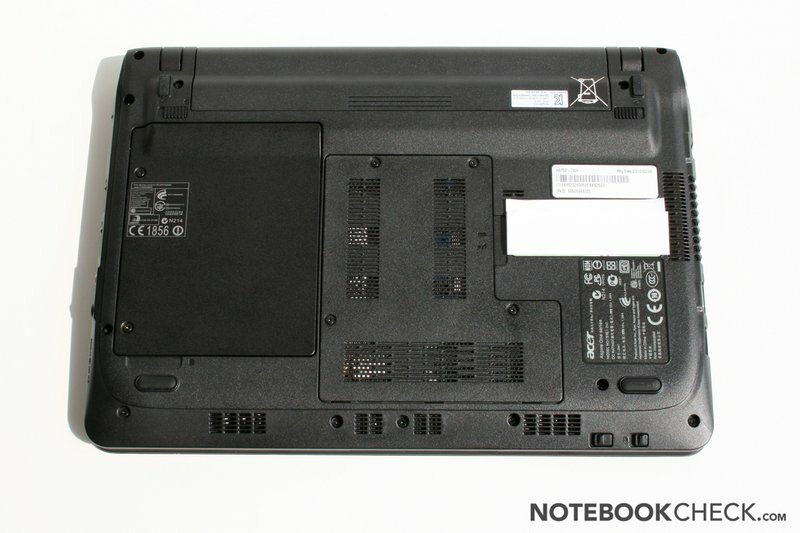 Both the thin front and the back of the Acer Aspire One 752 remain free of ports. One can find the VGA port, the power outlet, a HDMI port, as well as an USB 2.0 port can be found on the left side of the netbook. Whereas on the right side, there is a Gbit LAN port, a "Kensington Lock", microphone and headphone outlets, a cardreader (SD/MMC/MS/MS Pro/xD) and two additional USB 2.0 ports. 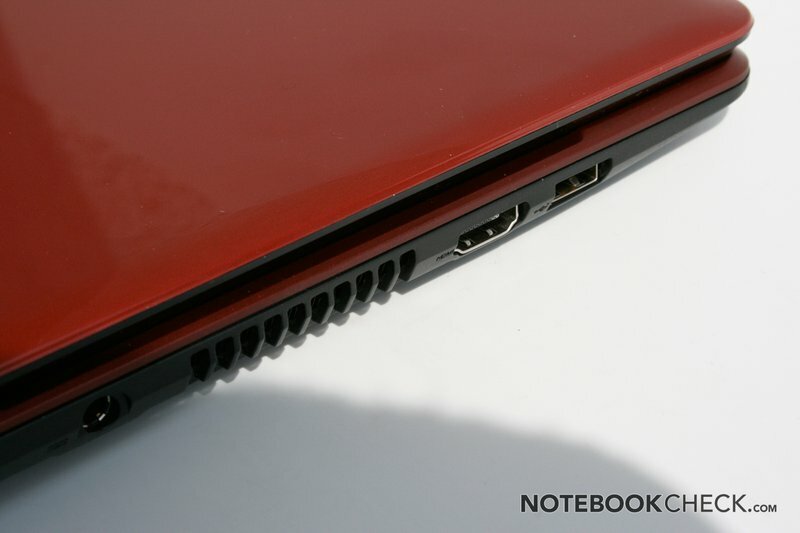 So basically, the netbook offers very typical ports for a netbook except for the unique HDMI interface. A WLAN and bluetooth switch can be found on the front side of the device. The current state (on/off) of the integrated modules can be found with a glance at the status LEDs. There are four such LEDs in total: two for the integrated modules, one for the state of the laptop and one for the power supply. The odd thing was that although our test model did not have a bluetooth module in it we still received the useless status LED and the switch which is intended for the control of the integrated hardware module. Another hardware, which is available, but not installed in our test model, is the integrated "Quadband UMTS" modem from Huawei. It is important to point out that Acer only uses the cheap WLAN modules from the 1000 series which do not have 5 Ghz support. So there might be a compatibility probelm with a few N-WLANs. On the bottom of the device, there are two slidebars which hold the removable 6-cell battery in place. 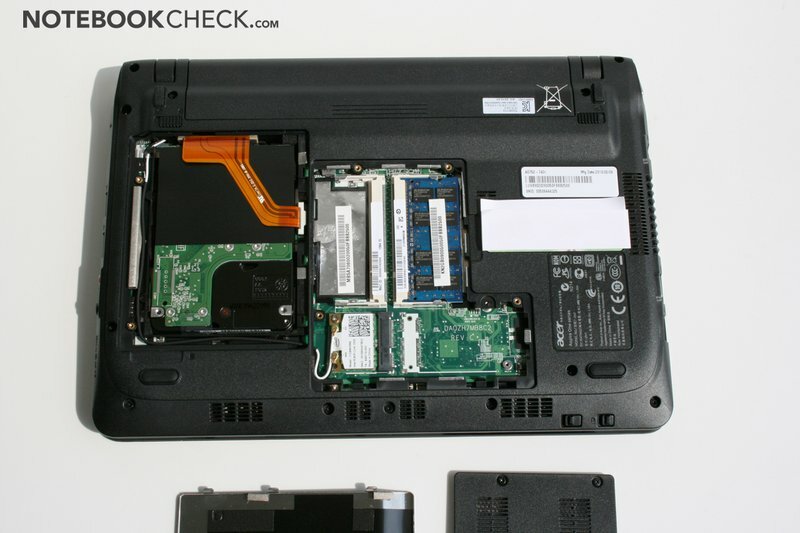 The hard disk and the RAM can be accessed easily after removing 2-4 screws. The software delivered pre-installed on the netbook are the Acer Tools and the Acer GameZone, which has lots of mini-games but no full versions. As usual, the pre-installed Internet Explorer is packed with bloatware and thus makes the whole system run very slowly when it is being used. The keyboard of the Acer Aspire One 752 seems good at first glance but closer inspection would be recommended. The generously-sized keys and the good layout make a good first impression. The pressure point of the keys is confusing and the whole keyboard can be pressed inwards by a half centimeter. The unfortunate design of the "backspace" key is much worse though. The key only reacts to heavy pressure right on the middle of the key, and most users, who use the 10-key typing system, hit the backspace key on the left side end, their input will not be recognised. A short "operation" on the key revealed what lay underneath. Although the backspace key is about twice as big as a typical key, the interface underneath the key is a small button in the middle which means that hitting the backspace key on the left or right end will not induce enough pressure to give the proper input. This problem is not evident in the other big keys such as "Space", "Shift", etc. In the end, this could just be a defect in our model. The touchpad of the Acer Aspire One is very nice. After minor adjustments in the system settings of the touchpad, it could be used very easily. The comfortable surface, multi-touch gestures, and the "borderless" design are good enough to leave the mouse at home, even if it does not offer the same comfort level the glass touchpad of the Macbook or the rubber "nubble" of the Thinkpad. The only faults of the touchpad are the tiny surface (which could not be increased due to the size of the netbook), the seemingly low-quality keys with odd pressure points and a strange feel to them. 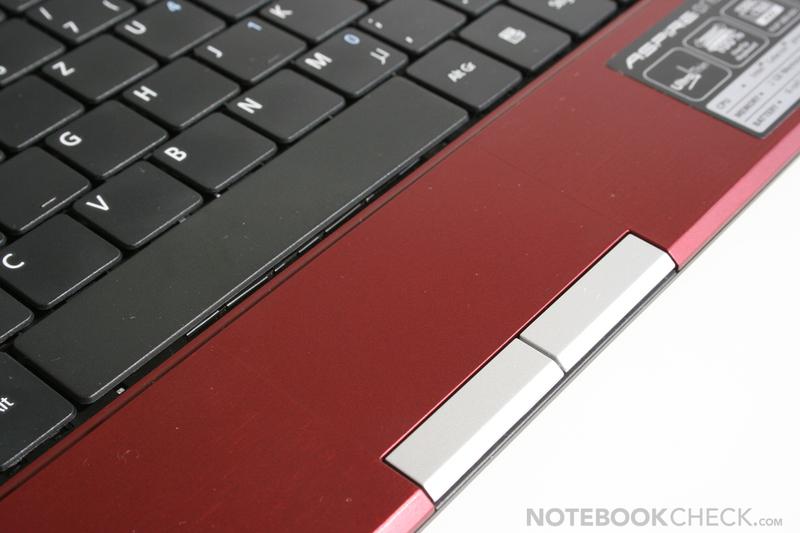 The touchpad fits right into the design of the netbook. However, the lack of bordering means that the user can not clearly discern where the touch-sensitive area of the touchpad starts. The 11.6 inch display (16:9 screen ration and 1,366 x 768 pixels resolution) of the Acer Aspire One 752 is mediocre at best. The brightness of the screen is good enough to overcome the distracting reflections on it during indoors use. The VGA webcam (0.3 megapixels) on the top of the display delivers decent quality pictures for software such as Skype and co. This impression is confirmed by the measured values: thanks to the LED backlight the display has balanced illumination, but this balance gets disturbed when the brightness is maximized. The 200 cd/m2 brightness level promised by Acer is not quite reached by the display and the minimum brightness level is a very dark 12.5 cd/m2. The relatively high black value results in a contrast of 174:1 which is not especially good. 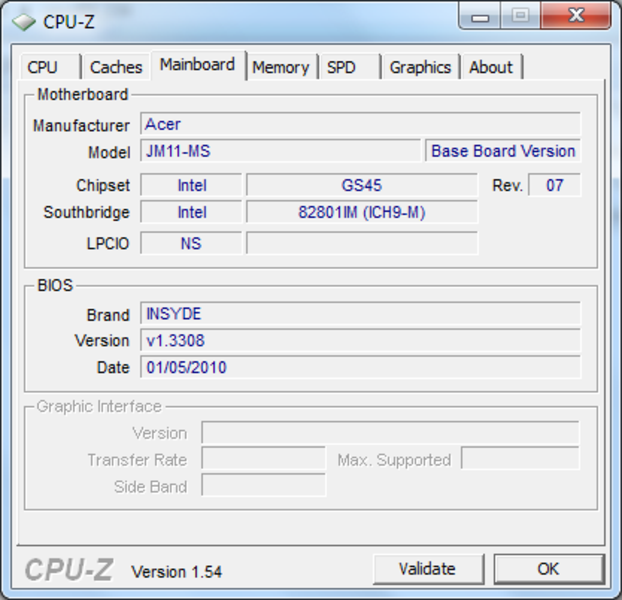 The measured values confirm that the panel used in the Acer Aspire One 752 is the same as the one used in its predecessor, the 751. 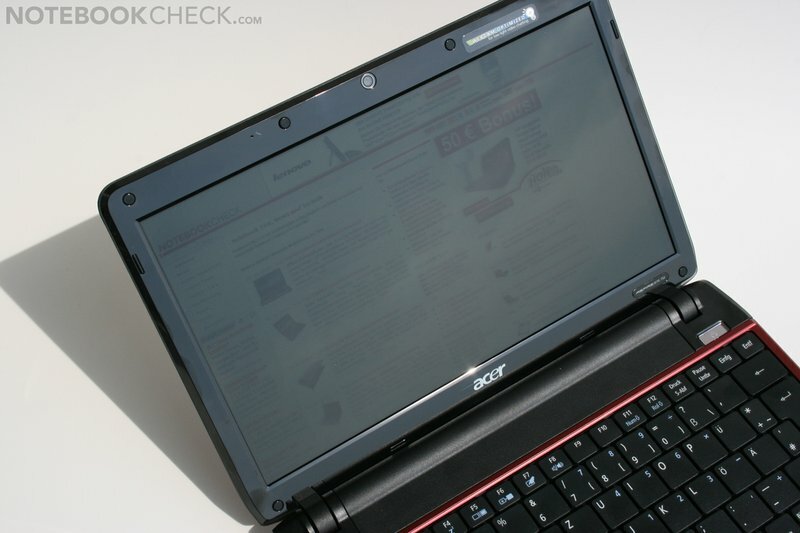 The use of the Acer Aspire One 752 outdoors in direct sunlight is not recommended as the reflections of the display and the rather low brightness levels hinder a clear legibility of the characters shown on screen. 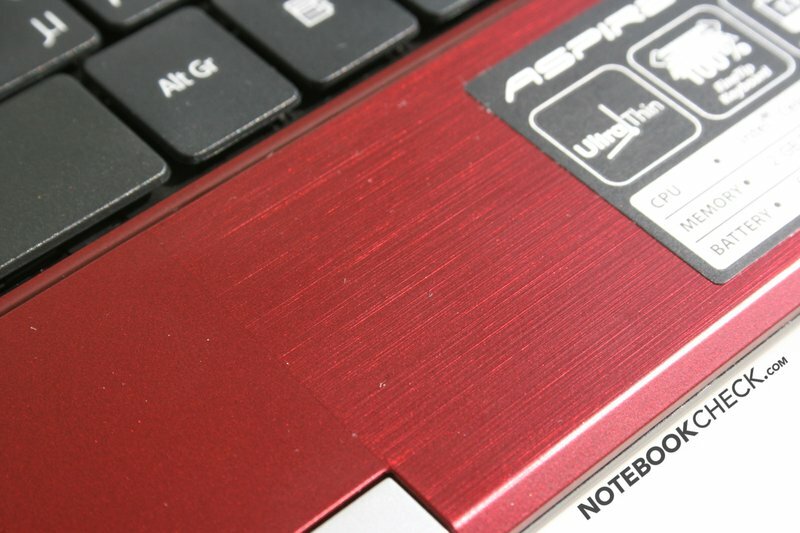 The viewing angle stability of the panel of the Aspire One 752 is typical to netbooks. For example, the screen has a hard time dealing with rapid vertical adjustments. This problem is expressed by the pale (from above) and inverted (from bottom) colors displayed during these adjustments. The horizontal stability is decent and only shows color changes later. The Acer Aspire One can be ranked in the top segment of netbooks when it comes to performance due to its 1,3 Ghz Celeron M 743 processor. 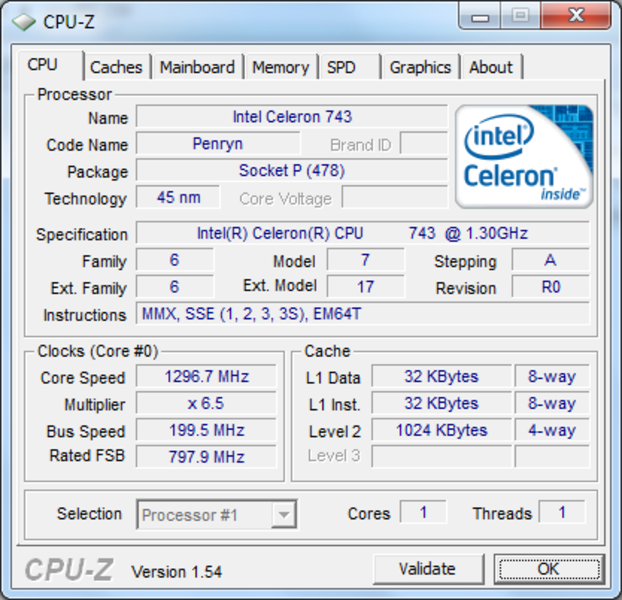 The Celeron 743 has a TDP value of only 10 W, and although it is a single core processor, it is still a lot faster than its Atom competition. The processor commands over a generously-sized 250 GB HDD and 2 GB of DDR2 RAM which delivers decent performance when using classic netbook programs such as Office, Web, etc. The integrated Intel graphics (GMA 4500 HD) was not able to play The Muppets: Bohemian Rhapsody on Youtube 720p properly. When we installed the current Flash 10 beta version, the playback improved but we could still not reach a fluid state. Offline HD videos ran much better on the Aspire One. The CPU managed to decode videos up to 720p (for example, MOV Datei in 720p). To play Full HD videos, the system needs the help of its integrated GMA 4500MHD graphics chip. 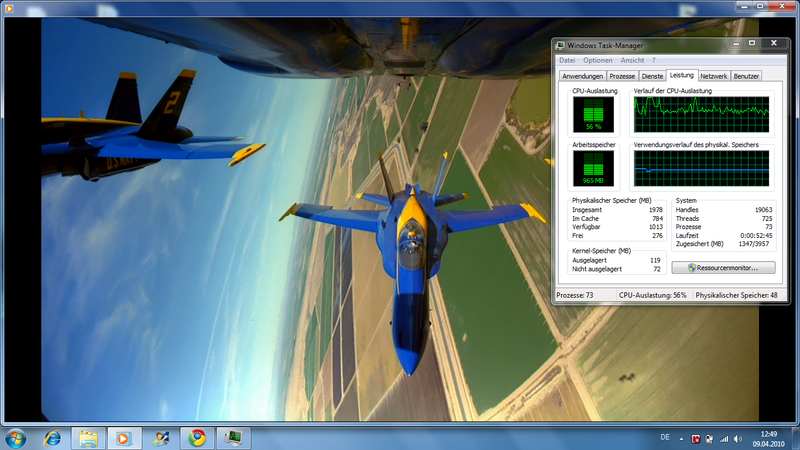 For example, this chip is used by Windows Media Player in Windows 7. 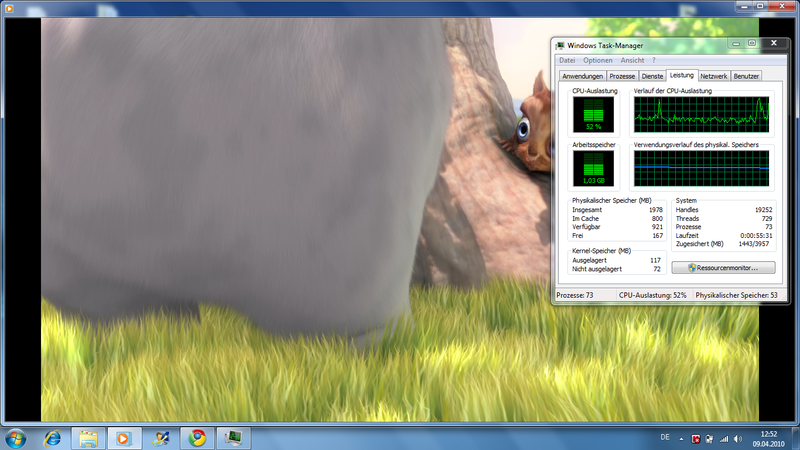 In our test, we could play Big Buck Bunny, coded in h.264, in 1080p fluidly with about 20-40% CPU usage. However, VC-1 videos were a bit too much for the GMA 4500MHD to handle and so they ran somewhat hesitantly with CPU usage at 90-100% (Elephant's Dream 1080p in the test). WMV 1080p videos (such as: The Magic of Flight) ran fluidly with about 60% CPU usage. Even the integrated HDMI port delivered Full HD videos fluidly on a connected LG TV (with audio). 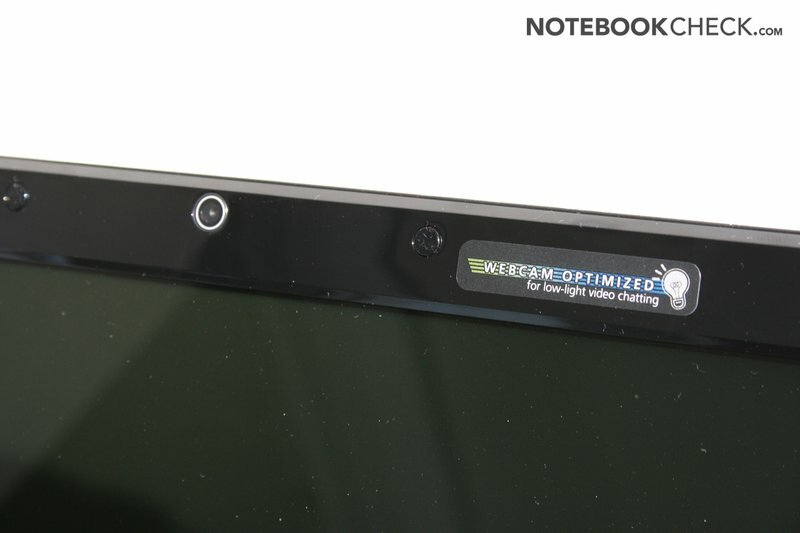 In comparison to the typical Atom + HD3150 netbooks, the CULV hardware in this netbook can really score. However, ION-based netbooks are much stronger. The real potential of the Celeron M processor was shown when we started the Office programs such as Word und Excel. There were absolutely no problems, and the programs ran at about the same speed as they would run on a much faster Core 2 Duo system. Still: we do not recommend opening and using multiple programs simultaneously. For example, if the user runs the Virus Scanner, he/she has to wait till it finishes before starting another program. 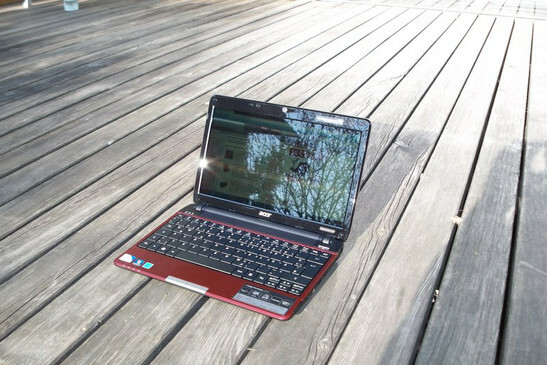 The Acer netbook ranked between the MSI X340 with SU3500 CPU and the Asus Eee PC 1201N with ION and Dual Core Atom N330 in the PCMark Vantage benchmark and thus reached the level of CULV notebooks with weak CPUs. 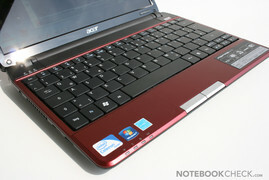 The Acer netbook scored 25% higher than the Lenovo Ideapad S12, which runs on an Atom processor and ION graphics. Right now, proper notebooks are able to score around 2500-3000 points and higher and thus offer better performance than the Acer Aspire One 752. The in-built 2.5 inch HDD from Western Digital can annoy the user with its palpable vibration. Sadly, the HDD does not even perform especially well. The measured values of an average data transfer rate of 57 megabytes/sec are rather slow when compared to the fastest 2.5 inch HDD in the test (Hitachi HTS725025A9A with an average data transfer rate of 83MB/s in the Lenovo Thinkpad T410). 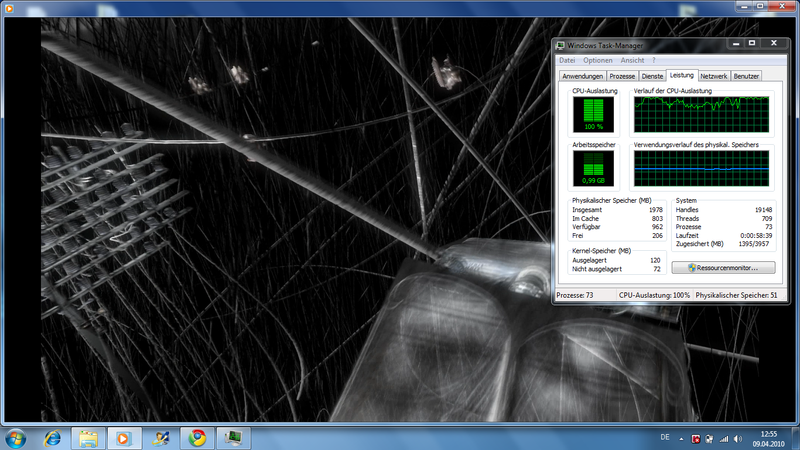 Faster models can also be found in a few netbooks. 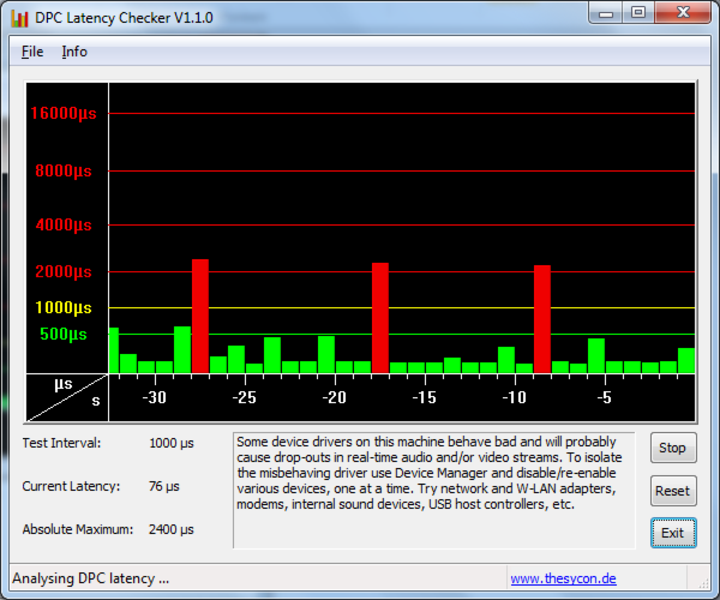 For example, the Seagate Momentus ST9160310AS in the EeePC 1002HA has an average data transfer rate of 71,5 MB/s. In our game benchmarks, the small Acer device was put up against ancient and rather less demanding games such as Half Life 2 - Lost Coast and Counter Strike Source. In high details, the laptop was unable to run the games fluidly. Even when the settings were set at minimum, CSS only managed 6-22 frames per second (fps). However, both games ran fluidly with high details on the Acer Travelmate 8571 (with Q9000 quad-core and dual graphics). 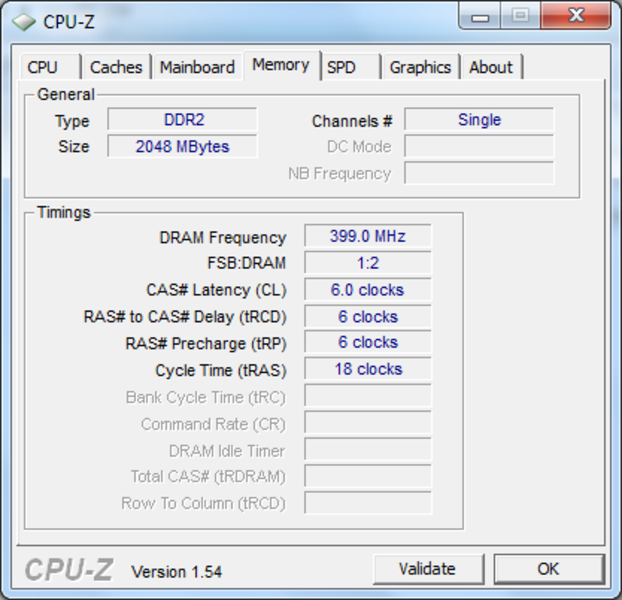 In the end, the weak 1.3 GHz Celeron single-core processor in the 752 is not meant for gamers. 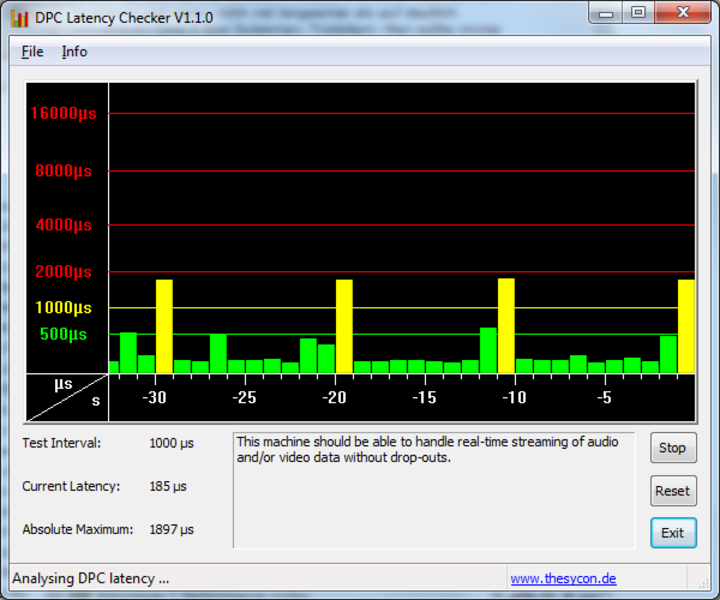 The DPC Latency Checker tool shows that the Aspire One had a maximum latency time of 1800 microseconds with activated WLAN. This latency time is fine and will not lead to any problems. The latency times shot up when we deactivated the WLAN card (normally deactivating the WLAN and Speedstep leads to lower latency times). Even though the Acer Aspire One 752 never really reaches uncomfortable noise levels, the cooler fan runs constantly and changes its speed all the time when the netbook is idle, causing a fluctuation in its noise emission, from 31,2 to 36 dB. Especially, the noticeable pulsating of the cooler fan is annoying in quiet environments. The cooler fan becomes noisier when the computer is under heavy usage: the noise emission rises till 39,4 - 39,8 dB. Those users who want to use the Aspire One 752 in the train or on a flight should not have a problem. However, one has to keep in mind, that in quiet environments the netbook will always be audible. 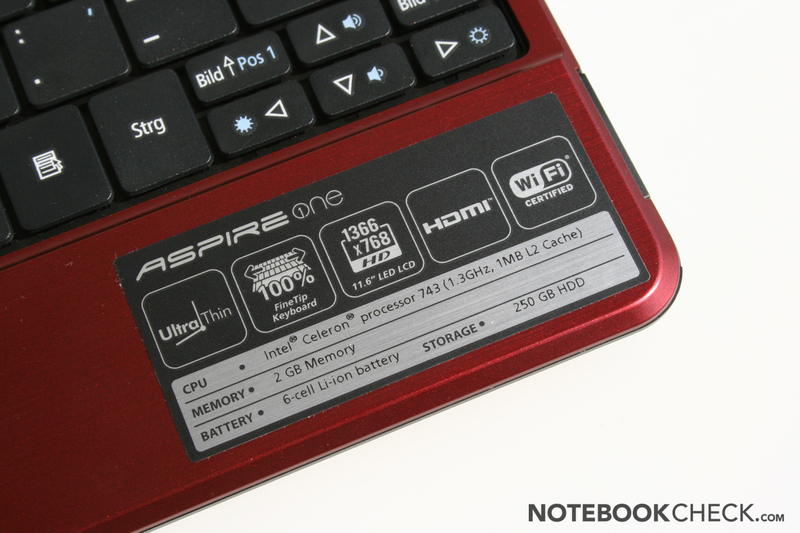 A pro of the Aspire One 752 is that its temperature emissions stays low. Palm rests and keyboard remain comfortably cool. In addition also the bottom side gets never too hot for a use on the lap. (+) The average temperature for the upper side under maximal load is 28.2 °C / 83 F, compared to the average of 30.7 °C / 87 F for the devices in the class Subnotebook. (+) The maximum temperature on the upper side is 29 °C / 84 F, compared to the average of 35.8 °C / 96 F, ranging from 22 to 57 °C for the class Subnotebook. (±) The average temperature of the palmrest area of similar devices was 28.6 °C / 83.5 F (-0.4 °C / -0.7 F). 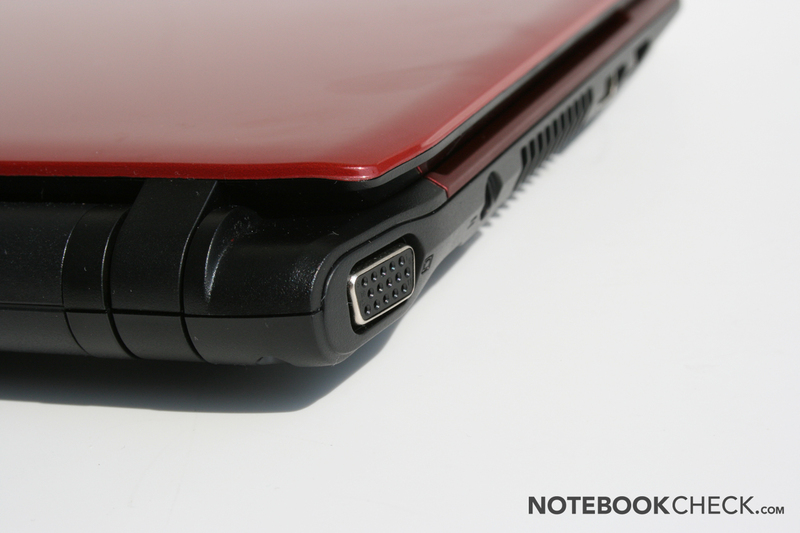 There are two speakers installed in the front of the netbook along with the audio in and outlets and the HDMI port on the right side. In short: the music lacks bass, high and low frequencies, but the sound output is still fine for news clips from Online Spiegel and similar things. 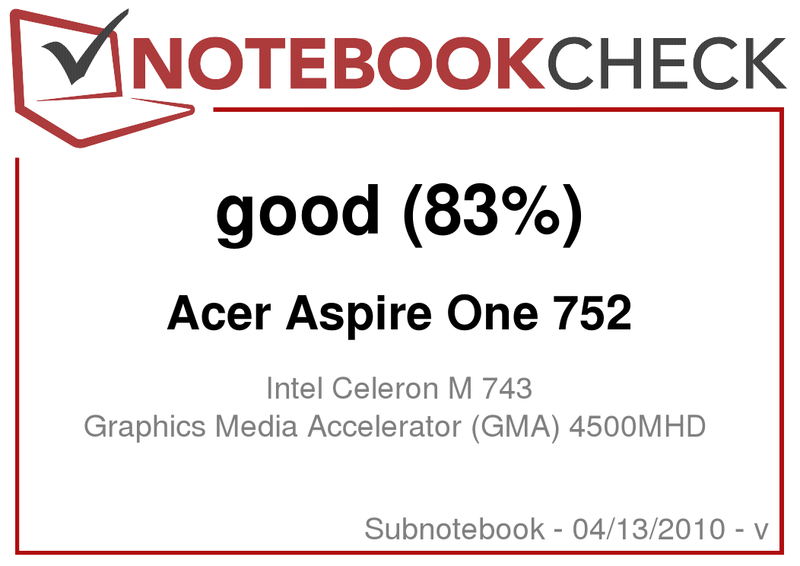 The battery life of the Aspire One 752 clearly shows that the Celeron M consumes more power than its weaker Atom-based competition. Still, the run time of over 5 hours is realistic and, for most users, sufficient. The measured power consumption lies in the region of an Atom netbook (comparable to the Samsung N120) and is thus ranked as very low. 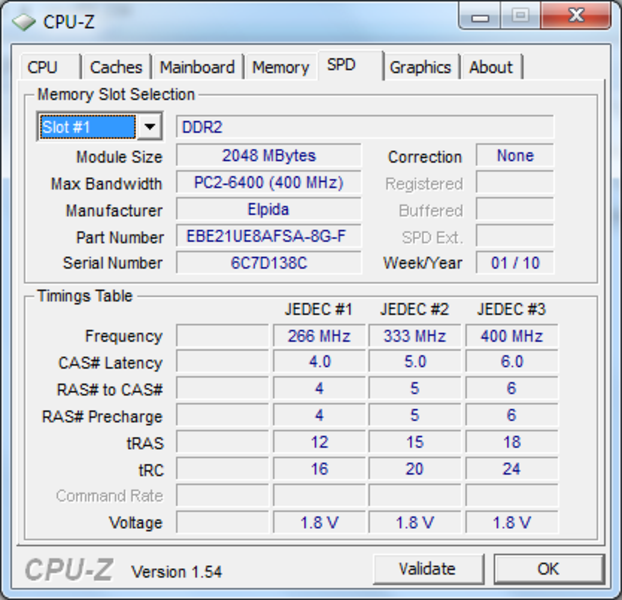 The ION based Ideapad S12 consumes the same amount when idle, but under heavy usage the power consumption is about 4-10 W higher (due to the 9400M graphics). Lucky strike! 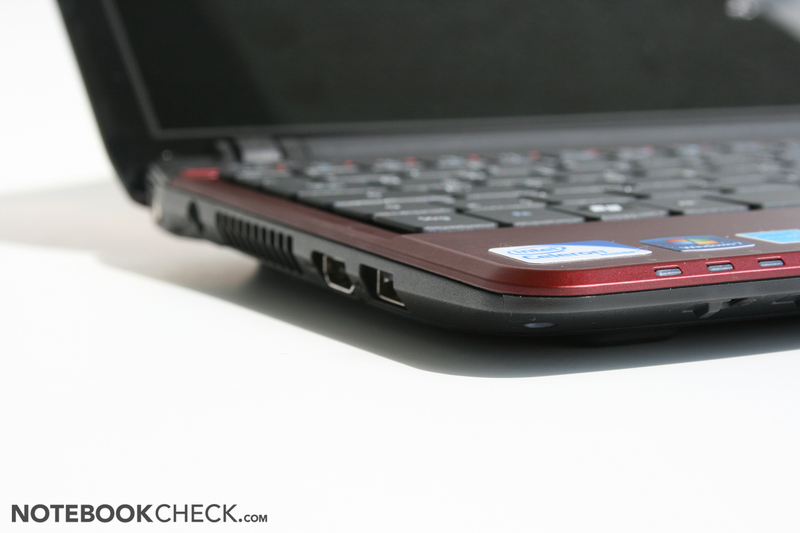 My first review on a netbook and I was lucky enough to land such a great one. This netbook has a relatively fast ULV processor, and although the processor lacks a Hyperthreading function, runs at a lower clock frequency, and only has a single core, the performance delivered by it can leave the rest of its Atom competition behind in the dust. Due to this, we can safely conclude that the Acer Aspire One 752 is well-suited for office use and also for web browsing. The device has good workmanship and the offered ports are decent for the current retail price of 430 euros. The biggest faults of the netbook are its keyboard, the modest display and the constantly running cooler fan. Otherwise, however, the netbook manages to convince us of its functionality. Still: we do not recommend the use of the netbook as an alternative for a main home computer, although it is equipped with the Celeron M processor. We had to wait too often for programs to load up, and occasionally, the use of multiple programs simultaneously would lead to the system being slowed down to a crawl. If the buyer wishes for a truly mobile device which allows him/her to surf on teh internet on the train and on the couch, then it would be recommended that he/she buys a "Smartphone" for the same money. A iPhone 3GS loads notebookcheck.com 3 seconds slower than an Aspire One 752. If that is the case with a strong processor such as the Celeron M, then I do not even want to know about weaker processors such as the Atom series. For me, netbooks still do not offer enough value for the money. Users still have to compromise a lot when using them. Maybe future lies with devices such as the Apple iPad, which have their own OS, which optimizes performance. Another alternative future might be cheap netbooks with better performance hardware which would allow them to run OS like Windows 7 and co. without any problems. The Acer Aspire 752 with the Intel Celeron M processor is a first step towards this second future. Nothing more and nothing less. 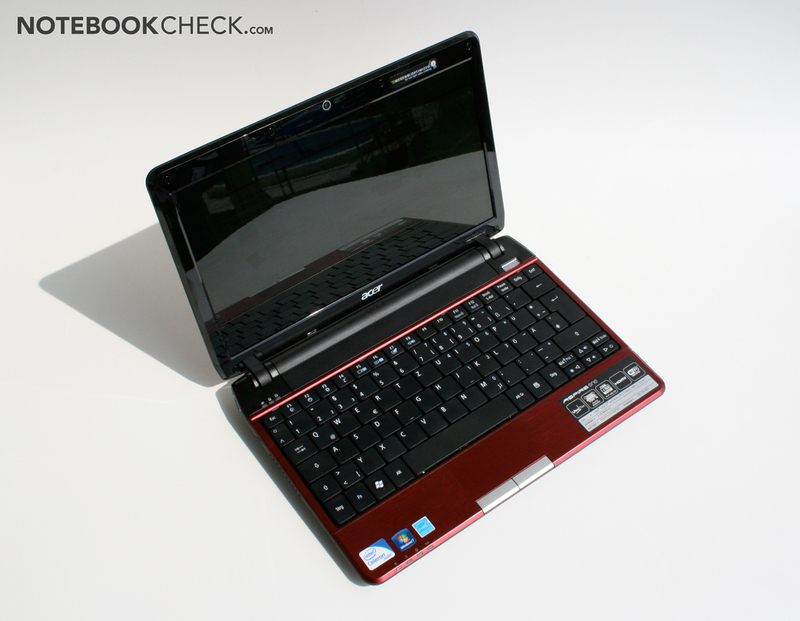 The Acer Aspire One 752 is a laptop with CULV hardware. The constantly running cooler fan is not loud but does annoy and distract with its constantly changing speed. ... and even the video performance is weaker. 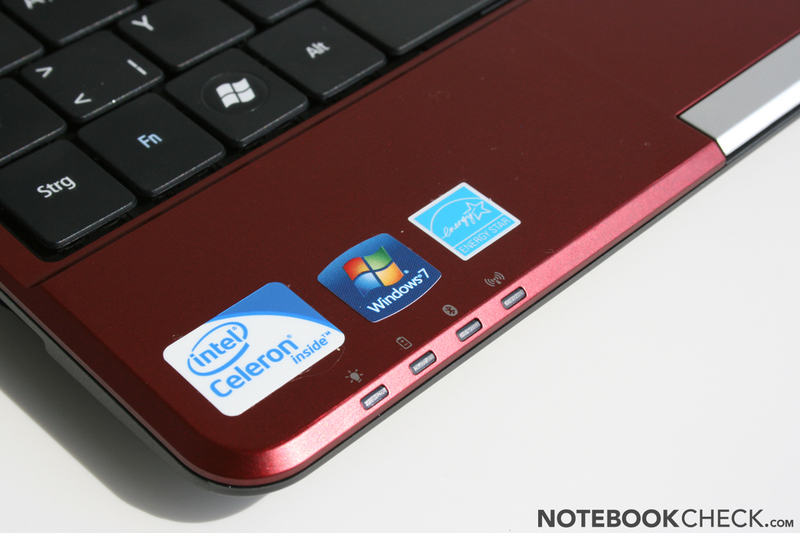 A Intel Celeron with 1.3 GHz and a GMA 4500MHD graphics chip offer more performance than an Atom-based netbook. The "Backspace" key in the test device worked erratically and only when pressed very hard (however, when we took out the key we could not recognise any damage or other fault that would hinder the input). The glossy display is not always very bright, but still it does offer a high "HD" resolution of 1366x768 pixels. Hard disk and RAM can be swapped out easily. An integrated webcam supports skype video calls. 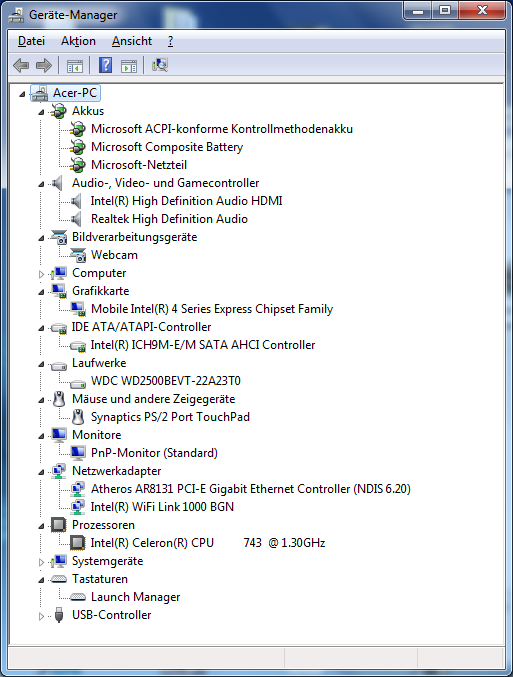 However, the HDMI port available on the model, is not found on Atom-based netbook without ION graphics. The ports offered are mediocre. Unfortunately the display cover has a glossy layer on it which is a magnet for all sorts of unwanted smudges and fingerprints. The hand-rest regions are made of aluminium and give a high quality impression. The slim and modern design is pleasing to the eye. However, thanks to that the surface remains for cool. The hand-rest regions are made of Aluminium. A nicer cooler fan and an anti-glare display. 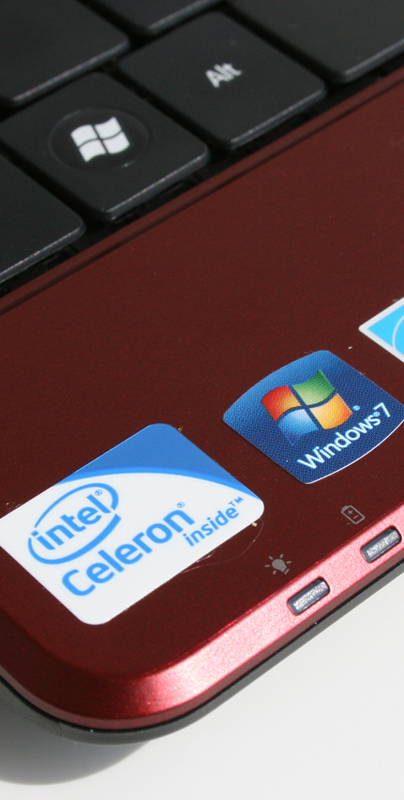 The small Celeron with the integrated GMA 4500MHD module delivers a significantly better performance than the other Atom-based netbooks. Ion netbooks such as the Lenovo Ideapad S12, the smaller CULV notebooks and of course all the Atom netbooks.